Geno Technology, Inc. was founded with a vision to simplify life science research. Our primary goal was to target the key techniques of protein research and find affordable methods to simplify and improve on these techniques. Over the years Geno Technology, Inc. has branched out into other areas of research, but our primary target still remains with proteins and our primary goal "simplify and improve on these techniques" still holds true. This message was reinforced in 2010 with the evolution of "The Protein Man", our iconic mascot and the G-Biosciences brand, a registered trademark of Geno Technology, Inc.
G-Biosciences' team examined every aspect of particular experimental techniques, ranging from protein extraction to protein purification and detection, to identify key areas that we could target for improvement. As a result of this we now manufacture everything from simple buffers at convenient concentrations and sizes to custom manufactured devices, such as Tube-O-Dialyzer, that enhance and simplify key techniques. Our key areas we focused on included, but not limited to, protein assays, sample preparation, electrophoresis, Western blotting, mass spectrometry, assay development, antibody production and protein purification. 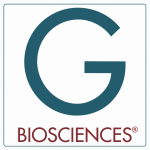 G-Biosciences now offers thousands of products for the protein and life science research market, all designed with the hope of make a researcher's lab time simpler and more affordable.